Upselling doesn’t have to be a dirty word. In fact, it can help you make your customers happier. Editor’s note: This post has been updated for accuracy and freshness. The original version first appeared on the Groove blog on October 7, 2014. What comes to mind when you think of the word upsell? For many of us, it might bring up images of sleazy salespeople trying to line their pockets by selling us extra stuff we don’t need. And, unfortunately, sometimes that does happen. Anyone who’s spent time buying a car from a dealership can attest to that. 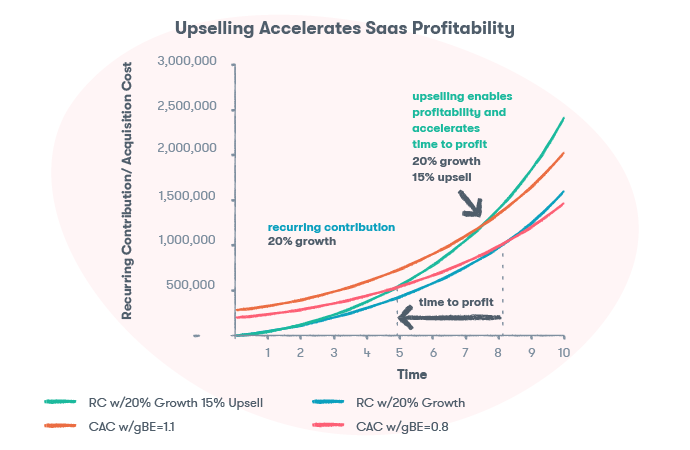 But when used properly, upselling can actually bring you closer to your customers, while bringing you more revenue, better retention and lower churn. The definition of upselling is selling a more expensive version of a product that the customer already has (or is buying), or to add extra features or add-ons to that product. If I’m buying a 27” TV and the salesperson offers me a 32” TV or an extended warranty, that’s an upsell. The meaning of cross-selling is selling products that are different⁠—but possibly related⁠—to the product the customer already has (or is buying). If I’m buying a TV and the salesperson offers me a Roku or Playstation, that’s a cross-sell. Both methods are useful, and both essentially do the same thing: help the customer get more value from your business, and help your business get more loyalty and revenue from the customer. For the purposes of this post, I’m going to use the terms interchangeably. Let’s look at the three biggest benefits of upselling and cross-selling. Sales guru Jeffrey Gitomer puts upselling into perspective when he describes it as helping your customers win. 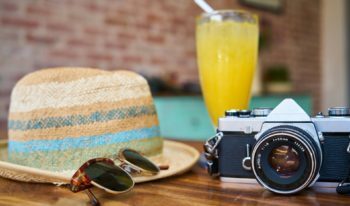 A reader asked Jeffrey for advice on how they could upsell him on a credit card product that was more expensive (and more valuable) than the one he currently used. Tell me how I win. When I win, you win. Here’s another example: a few months ago, I checked into a hotel on a weekend trip with my wife. As we were checking in, the clerk offered me an upsell: would I like to add breakfast for two — normally $49 — to my room rate for “just” $29? I accepted without hesitation, and I was happy to do so. At $20 cheaper than the standard rate, I felt like taking the upsell offer was an easy win. From the hotel’s perspective, they upsold me on additional services that I otherwise would not have purchased, made extra profit, and built a deeper relationship with me, as that breakfast is one more opportunity that they’ll get to serve me. A clear win for them, too. Takeaway: Upselling isn’t just a sales tactic; it’s a customer happiness tactic that can help you build deeper relationships with customers by delivering more value. But when we think about it, it really shouldn’t surprise us. Wouldn’t we much rather buy from a company we already trust than one we’ve never done business with before? Not only is upselling easier than selling to a customer for the first time, but it can help you grow faster. So many SaaS and eCommerce companies focus all of our efforts on getting new customers, when an even bigger opportunity often lies untouched in front of us: making our existing customers happy and selling more to them. Takeaway: Upsells are an easy win for growing your bottom line and accelerating your path to profit. Chris Yeh, an investor, entrepreneur and the VP of Marketing for PBWiki, shares a great example of a well-done support upsell when he called Geico for roadside assistance. 15 minutes later, I had agreed to add $1 million in additional coverage for my car and home, at a cost of right around $100 per year. I’ve been a GEICO customer for 16 years already, so it’s not much of a stretch to speculate that I might be a customer for another 20 years. That means that GEICO turned a costly customer service call into an incremental $2,000 in lifetime revenue. When it comes to increasing CLV, 15 minutes could earn you 15% or more on car insurance, or whatever it is that your business sells. Takeaway: Each upsell can increase the lifetime value of your loyal customers, paying off for many years down the line. There are lots of upselling techniques out there, and the right ones to use depend on your business and your customers. To give you some ideas, check out these four awesome upsell examples from SaaS and eCommerce companies that you can try for yourself. Offering the upsell within the app — at a relevant time and place — helps customers know and remember that a solution is readily available when their problem appears. Takeaway: In-app upsells, as long as they make it clear why the customer will win by taking them, can be an effective way to not only increase revenue, but engagement, too. 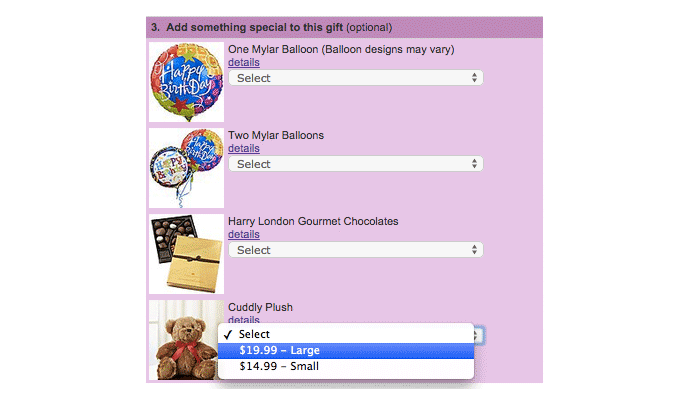 This is, by far, the most commonly used method of upselling in eCommerce. But there are good and bad ways to do this. As a customer, I appreciate that I can upgrade my purchase. They could drastically increase their conversion rate if they offered upsells that were more related to the product you just purchased. For example, I added a domain name to my checkout, and they offered me this product in the picture below. Why would they offer you a website seal when chances are you don’t even have hosting, a website or even web traffic? I don’t know about you, but I’ve never built a website before I acquired a domain name. Takeaway: The point of purchase is the most common upsell point for a reason: it works. Customers are in “buying” mode with their credit cards out, and ready to do business with you. 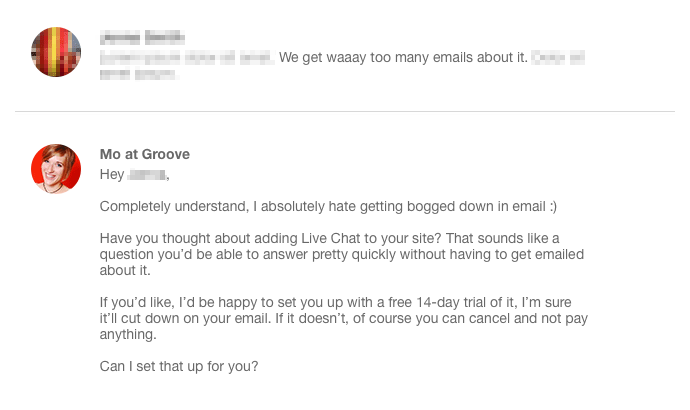 Before we killed our Live Chat app, we offered it as a way to help stem the flow of emails for customers who got too many messages. It was an upsell that was popular with our customers because it helped them solve a problem that they were contacting us about, and added additional value on top of that (by helping them offer additional convenience to their customers). Now, of course, we offer one of our partner chat apps, but the value proposition for the customer remains much the same. Takeaway: By offering an upsell that can help solve your customer’s support issue, you can help them, and your business, win. Note: upsells should never replace support, as in: if you can solve the problem without an upsell, do it. Use these events as opportunities to remind your customers about the value they’re getting from doing business with you, and think about how you can upsell them now to take things even further. Ramit Sethi sells online courses for people looking to succeed in their careers, personal finance, online business and productivity. With multiple courses, he has a lot of opportunities for value-add cross-sells. One of the ways he delivers these offers is immediately after a customer success milestone. In it, Ramit offers an upsell — with a free month-long trial — to his membership program. It comes at an opportune time: when the customer is feeling good about the success they’ve achieved. Takeaway: Target your customers for upsells when they hit customer success milestones, and when the value of your product is most apparent. 1) Make sure they’re happy with the service and experienced you’ve delivered to them. NEVER sell to an angry, upset or disappointed customer. There are a couple of useful options for singling out customers who are happy. You can use labels in your help desk software (we use Groove, for obvious reasons) to tag customers who are “fans.” That way, when a fan emails you and you sense an opportunity for an upsell, you’ll already know that they might be open to it. 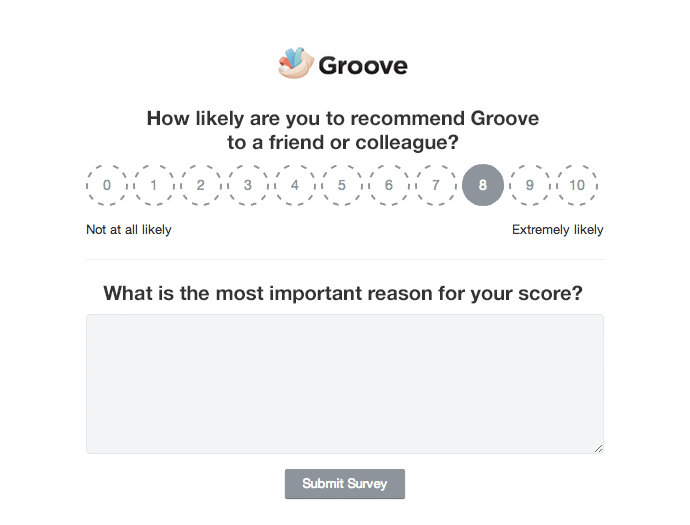 Another equally effective way—we use both—to identify happy customers is with Net Promoter Scores, one of the most important customer service metrics. While this data can help you make better decisions on a number of fronts, knowing who your promoters are is especially helpful for knowing who to target your upsell offers to. 2) Focus your upsell pitch on how the customer wins. Remember how upselling works best when you tell the customer how they win? 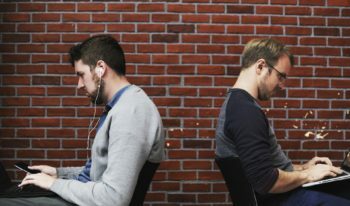 While this is great advice for any sales, focusing on how you’re helping the existing customer win even more is absolutely critical for upselling without being pushy. From looking at your account, it looks like you’re now eligible for a big discount on our comprehensive coverage. Since you’re going to be waiting for the tow truck anyways, would you like to hear more? The agent could have started with “would you like to hear about our comprehensive coverage?” But THAT would be pushy. Instead, the focus is on Chris’ big discount, not on Geico’s product. They told Chris how he wins, and that made things interesting for him. Takeaway: Think about the products and services you might upsell your customers on, and then think about how those products help them win. Hint: nobody cares about your product. They care about their problems. Showing them how you can solve those problems is the key to upselling successfully. If you’ve been hurt by years of terrible upsells, then it’s understandable that you might be hesitant to try and use them yourself. 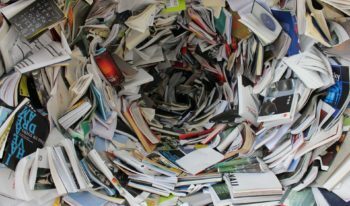 But hopefully this post has showed you that upsells can be honest, honorable and valuable in growing your business, and they don’t have to be pushy or sleazy. Upselling is a valuable skill for anyone delivering customer service, because it can help you achieve your number one goal: make your customers happier and more successful. Have you used or seen any great upselling tactics that I missed, or are you struggling with thinking about how to offer upsells in your own business? Let me know in the comments below.